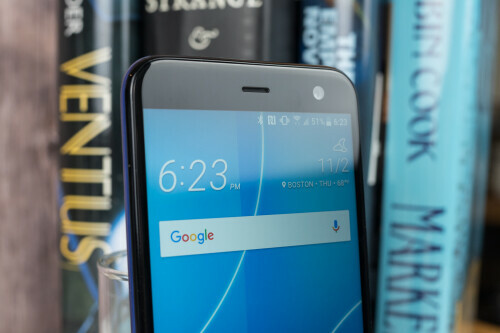 Smartphones run the gamut in terms of features and prices, and while we all might love to be carrying the hottest, best-performing, most stylish handset around, models like that have a tendency to also be among the most expensive. Luckily for shoppers who'd rather not spend the better portion of a month's rent on a new phone, there are also tons of more affordable options worth checking out. 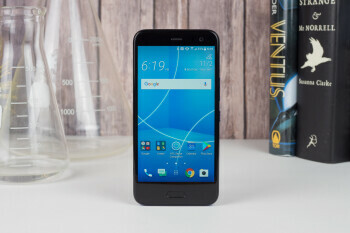 While some of those more budget-concious phones are built from the ground up as such, others emerge as scaled-down versions of full-price flagships, aiming to deliver a user experience that's still somewhere in the ballpark of what we'd get from their more expensive brethren, while dialing back on some of the less necessary expenditures. 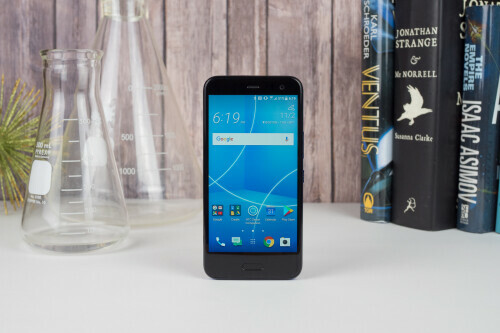 That kind of flagship-lite _phone_ is just what we're looking at today, as HTC introduces the U11 life, a device that aims to deliver some of the same features and design elements as this year's earlier U11, while doing so for half the price. What kind of trade-offs are we in store for? 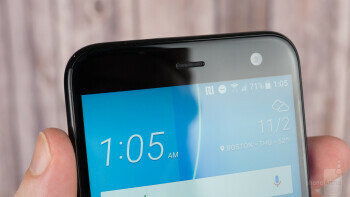 Does the U11 life succeed in its mission, or are you better off paying more for the U11 proper? Let's take a look. HTC's goals for the U11 life are pretty straightforward: take the U11, shrink it down a little bit, and make the _phone_ more affordable in the process. 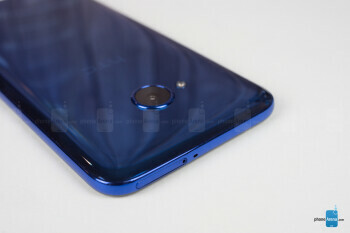 So while the U11 life has the same basic look as its flagship namesake, instead of metal edges and a glass back, we've got a phone that instead incorporates a lot of plastic. The manufacturer has clearly tried its best to recapture the color-changing effect of the U11's back panel, but it's not quite the same here – there are aberrations where reflections separate into different colors, and the effect is just not as impressive as we saw with the U11. That said, you have to be paying a bit of attention to spot the differences, and at a casual glance HTC's efforts are pretty successful here. We are curious how well the new acrylic back will stand up to scratches over time, but so far we haven't run into many problems. Like the flagship, this model is also IP67-rated against dust and water ingress. 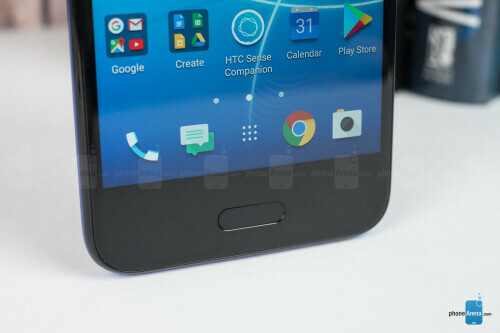 Phone layout is very similar to the U11, with maybe the most pronounced difference being the absence of antenna lines around the handset's edge, thanks to the new plastic exterior. Buttons and the SIM tray are in the same places, as is the front-mounted fingerprint scanner. Around back, the camera may be larger this time around, and downgrades from a dual to single-LED flash, but placement is largely consistent. Down below, the speaker slot and USB port swap places. 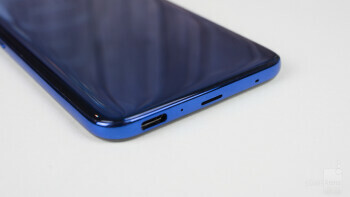 That's not great, and if there's one really annoying thing about the U11 life's design, it's that the bottom-edge USB Type-C port is mounted off-center, over to the phone's right. Type-C has been a great advancement for smartphones, freeing us from the hassle of making sure our micro-USB cables were facing the right way. But we're so accustomed to centered USB ports, that this move undoes a lot of that convenience, forcing you to once again pay more attention than you should need to when charging your phone. 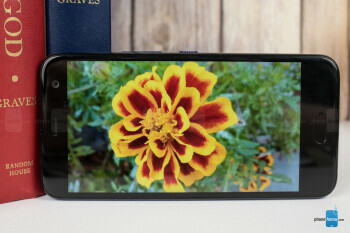 While the U11 went with a 5.5-inch Quad HD display, the U11 life offers a more conservative 5.2-inch 1080 x 1920 screen. The good news is that brightness is solid, despite the fact that peak brightness isn't as high as on the U11. Color accuracy is also decent but not perfect, resulting in a panel that feels right at home on a mid-range handset like this. That kind of flagship-lite phone is just what we're looking at today, as HTC introduces the U11 life, a device that aims to deliver some of the same features and design elements as this year's earlier U11, while doing so for half the price. HTC's goals for the U11 life are pretty straightforward: take the U11, shrink it down a little bit, and make the phone more affordable in the process. 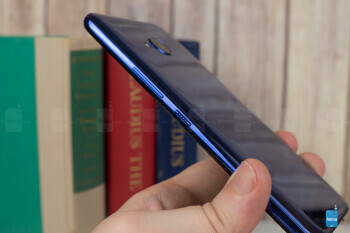 So while the U11 life has the same basic look as its flagship namesake, instead of metal edges and a glass back, we've got a phone that instead incorporates a lot of plastic. HTC's interface on the U11 life is much as we got on the U11 proper, with Android 7.1.1, pretty minimal skinning, and the presence of HTC BlinkFeed. 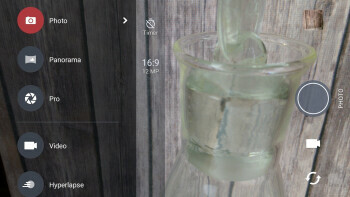 Also like the U11, there's HTC's squeeze-to-use Edge Sense feature. 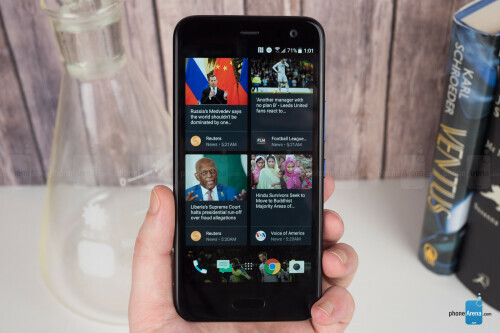 Thankfully, it's fully intact here, with customizable actions and the ability to set up separate shortcuts for short-squeeze and long-squeeze interactions – unlike the Pixel 2 and its limited Assistant-only squeeze shortcut. While the full-sized U11 gets a high-end Snapdragon 835 chip, the life is designed to maximize value, and that means going with a less powerful, but simultaneously less expensive processor: the Qualcomm Snapdragon 630. Like the 625 and 626 before it, that means we're looking at a nice balance between adequate speed to get through common tasks, while also keeping power consumption to a very battery-friendly level. The phone's Snapdragon 630 gives it performance similar to the Snapdragon 626, as we've seen in other 2017 mid-range relatives of flagship phones like the Moto Z2 Play. While there's the occasional stutter here and there, for things like social media, video playback, and web browsing, this chip is more than adequate for meeting user needs. And while the 3GB of RAM won't set any records, the use-cases we expect for this hardware really don't demand anything more. With 32GB of storage, the U11 life may not be as generously equipped as pricier phones, but you're not going to find too many 64GB options at this price level. And with microSD expansion, you're free to augment that as much as you'd like. 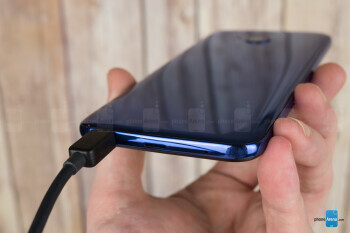 There's noting really special going on with connectivity for the U11 life, and the most noteworthy feature (or lack thereof) is the absence of an analog headphone jack – we'll talk about that a little more as we discuss the phone's multimedia setup in just a moment. And as we already mentioned, the off-center USB Type-C port takes a little getting used to. 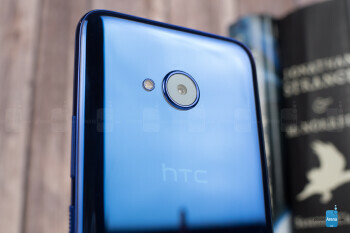 As far as wireless connectivity goes, the U11 life is launching on T-Mobile, but it will be also available directly via HTC. Keep in mind that it is not made to operate on Verizon or Sprint. The U11 life is equipped with a 16MP main camera, as well as a 16MP front-facer, both with f/2.0 apertures. 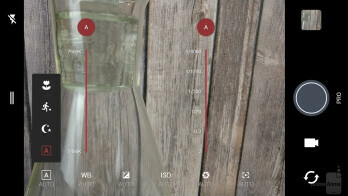 The primary sensor uses phase-detection auto-focus, but there's not a lot in the way of hardware extras here: no laser auto-focus, no optical stabilization. But you don't always need a ton of bells and whistles to get some great-looking pics out of a camera. So how does the U11 life fare? Let's take a look. While we didn't expect a lot going in, we found ourselves pleasantly surprised with the images the U11 life was able to capture. A lot of times you'll be looking at the viewfinder, expecting a shot to be underlit and lacking detail, but then the HDR Boost algorithm does its magic, and you end up with a quality, usable shot. The HDR effect can take a few seconds to process, but the results are worth the wait, and salvaged enough “iffy” pics to have us feeling pretty confident about the U11 life's camera. Even low-light shots came out alright; while on occasion we pushed things too far and ended up with a noisy, unfocused mess, by and large we're quite satisfied with what the U11 life has been able to do. Being able to launch the camera with a squeeze (thanks to Edge Sense) is a nice bonus. While this all sounds good, we ran into more than a little glitchy behavior when using Edge Sense in its default squeeze-for-camera mode. Things would work fine for a while, until the camera app would crash and create other system instabilities, ultimately requiring a reset. 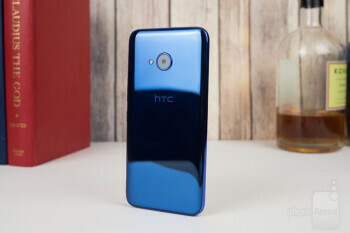 We're not sure if the problem affects other U11 life units or just the review sample we were provided with, but in any case, we've contacted HTC, and we'll update you if we learn more. The video situation on the U11 life is also decent, supporting filming in resolutions up to 4K. 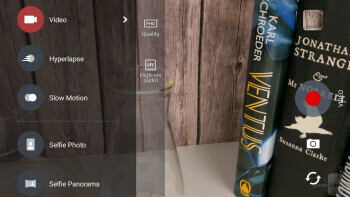 Footage can be a little shaky, but still sharp and detailed, and audio quality's on the right side of things; there's even a high-quality audio option that records losslessly, though it's going to take an ear more fine-tuned than ours to notice the difference. In-video refocus times are some of the speedier we've seen, helping to keep up with rapidly-changing scenes. Having already tackled the display, we've got three audio situations to evaluate to complete our picture of the U11 life's media performance. First there's the speaker, which isn't great. It's loud, but audio tends to have a hollow quality that emphasizes low frequencies at the expense of crisp treble. 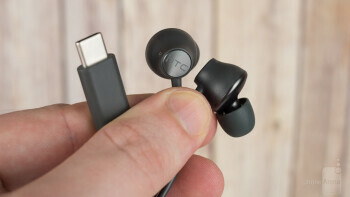 Then there's the bundled headphones, which are actually very nice – the same active-noise-canceling pair we saw on the U11 itself. Sadly, the tale of shared U11 audio accessories doesn't continue further, as we miss out entirely on the third option we were hoping for: analog headphone support. 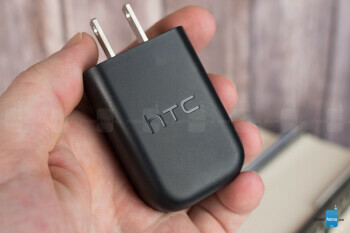 The phone is USB-only, ditching the built-in jack, and unlike the U11, HTC doesn't include an adapter with the life. We asked the company about this and were told it was a cost-saving decision. For a mid-ranger, where you're trying to balance price and functionality, we suppose that's not crazy, but it's not a choice we're at all happy with, either. When did it become so hard to deliver high-quality voice calls? Voice calls on the U11 life generally sound pretty good. After some recent upset with voice calls on other phones, we've been paying closer attention to sound quality, and here we did indeed notice some interference: a repeating series of quiet clicks coming from the phone's earpiece. While they continued even after our calls were completed, they're so quiet that you don't hear them unless your ear is right up against the the phone. Compared to the iPhone 8 or Pixel 2, they're barely noticeable, but if you plan to spend a lot of time making voice calls, it's something you might want to keep in mind. The U11 life has one really good thing going for it when it comes to battery life, and one that's working against it. 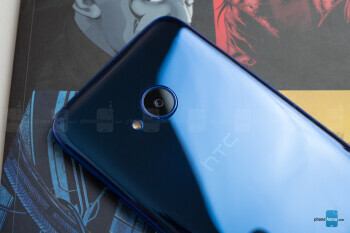 While HTC chose to build the phone around the Snapdragon 630 processor, which comes from the same power-conservative lineage as the 625, which has been at the heart of some of the longest-lasting smartphones we've evaluated, the handset also has just a 2,600mAh battery, which is a bit on the small side of things; even the smaller-screened Pixel 2 scored a larger battery. What's the end result of that push-pull balance? It's actually not too bad, with the U11 life enduring for just under eight hours of screen-on time in our custom test. While that's fine, phones in this mid-range space have the potential to be among the best-performing in battery life, and times of 10 hours and up aren't uncommon. So while the U11 life doesn't embarrass itself, nor is it an exceptionally long-lasting phone, either. Recharge times are thankfully on the lower end of the spectrum, with the U11 life powering back to full in just over 100 minutes. There are still a lot of little issues we have with the phone, from a mushy speaker to the absence of an analog headphone adapter. 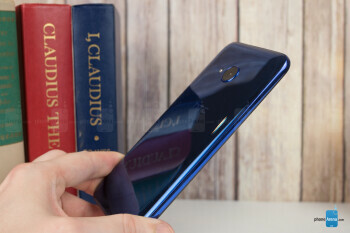 But while there's a fair amount of strong competition in the mid-range space, and some very nice lower-end flagship options if you're willing to spend a little more, the U11 life is ultimately an alright phone for its price point. Just how much will this hardware run you? Direct sales through HTC will only set you back about $350, and picking the phone up through T-Mobile will run you even less. If you like colorful handsets, and think squeezing your phone to control it sounds like a neat idea, the U11 life is right up your alley. It's not a phone we'd automatically recommend to mid-range shoppers, but there's enough to like here that it's definitely worth considering.